Gotta’ love that Donald Trump!! He is one of the few politicians using their brains, not just padding their bank account! Donald Trump has declared ‘war’ even before his 20 January Inauguration. No, it’s not a pending nuclear conflagration that’s in the offing; just the end of the wind industry as the world has known and grown to suffer it. 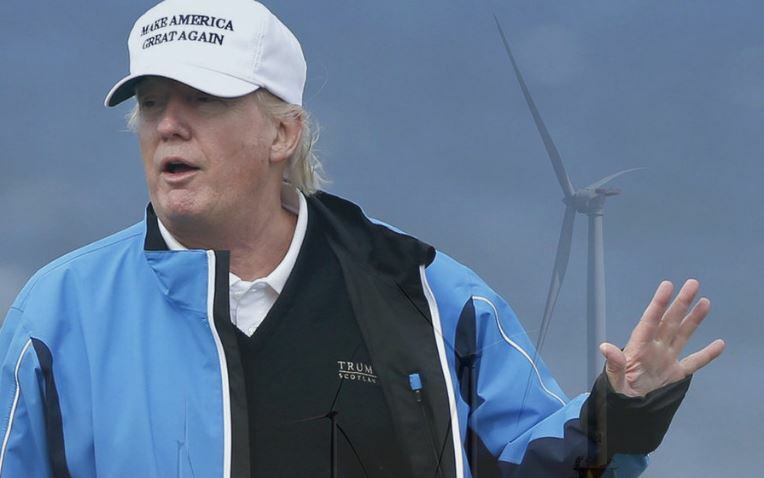 U.S. President-elect Donald Trump told British politicians he hates “awful” wind turbines in Scotland because he believes they “sully” the country’s beauty, according to BBC News. Trump allegedly told Nigel Farage and Andy Wigmore, both of whom were leaders of the Brexit movement, that he’s “personally offended” by wind turbines. Trump, wants to create a job for the jobless citizen. One of the reason why he want to declare “war” on wind turbine because he wants to open a coal mining. Yes! Newer, clean burning coal technology. It’s being used all over the world! Wonderful! It is still depends on type of coal. The more higher grade coal, it is lessen the carbon emission. Regarding that, another reason for opening a coal mining because he wants to create a job for the jobless citizen. Yes he does, Christian! I think that’s a wonderful goal, good for all Americans!! That’s he promised to all jobless American during Election Campaign. Hopefully, all jobless American will create a job for them by opening a coal mine.